The changes, of course, hint that Amazon’s long-rumored Android tablet is right around the corner. The site overhaul is being rolled out just prior to the tablet’s launch, or goes the current speculation. Well, at least we now know when the redesign’s rollout will be complete: this month. (Update: we were subsequently informed that “end of the month” is incorrect, which is what Amazon told us initially. The complete rollout is “TBD,” it says now). 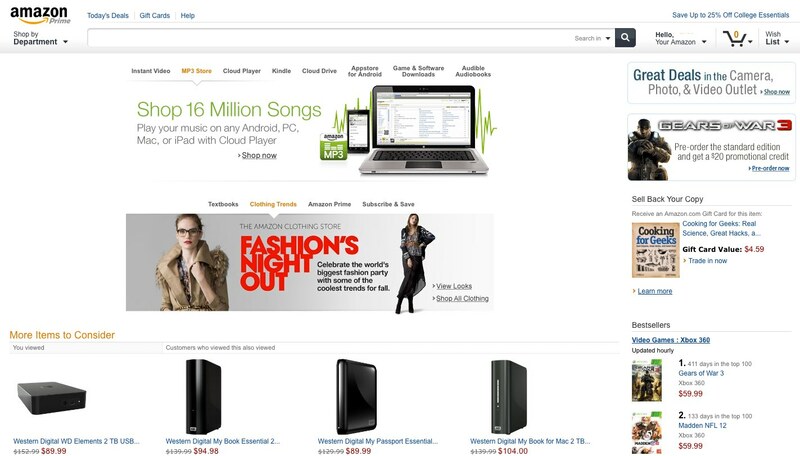 Amazon has been testing the new design since late August and is now prepared to have it go live to all customers later this fall. This not only includes U.S. visitors, but international customers, as well. It will not disclose the percentage of users who have already received the update, however. The company believes the updated look will make searching for and discovering items easier. But in particular, Amazon notes that the design is meant to better highlight products like MP3’s, Kindle eBooks, digital games and apps from the Amazon Appstore for Android. Now, what customers would be looking for those sorts of items, again? Hmm. In addition, we’re told that the redesigned site will be the default homepage for both tablet and PC visitors, only those browsing from a smartphone would see something different – a mobile-optimized site. Hmm. If you haven’t seen the redesign yet, check out the old (top) and new (bottom) screenshots below.